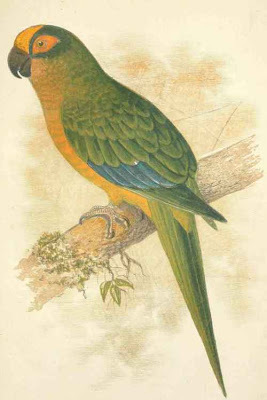 Today's guest blogger is Albert the Writing Parrot, a thirty-four year old Yellow-Naped Amazon, Booktryt's mascot, my ward since fledged, and, pathetically, my most successful long-term relationship. He knows more about these books than I do. If his writing voice sounds similar to mine do not be surprised. 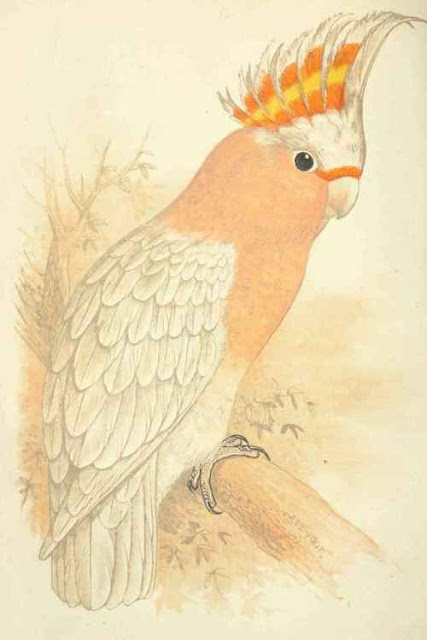 He is, after all, a parrot - SJG. I'm delighted to take pen in zygodactyl foot and contribute to Booktryst today. Thirty-fours years after Gertz tried to teach me how to say, "I want a great big pizza," I'm pleased to report what will soon become apparent: My vocabulary has dramatically increased, and my diction is poifect. Grand Eclectus Parrots, male (L) and female (R). It has been my experience that all parrot lovers are a little tetched in the head. You say "Hello" to a parrot freak and they get all gushy, "Oh, he talked!" like it's the eighth wonder of the world and you're the first parrot in history to throw a vocal crumb to a human. 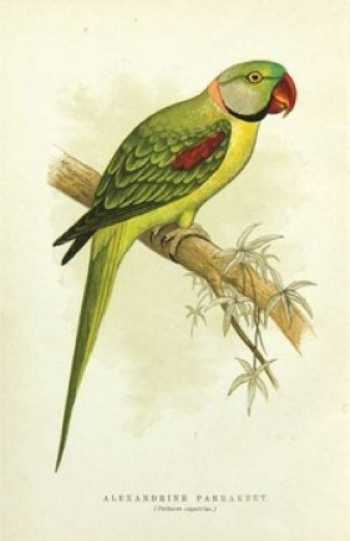 Psittacosis, aka Parrot Fever, is not confined to bacterial activity; parrot people are omnivorous, fervent and gentle suckers who will consume any parrot-related product, art, toy, or miscellaneous tshoschke. Money is no object. 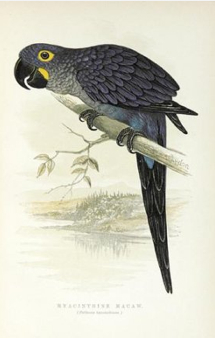 Yet a parrot lover who owns a $6,000 hyacinthine macaw will not spring for first editions of the great parrot books; they go for the reprints, of which there are many. I don't get it. They'd rather spend the money to acquire another parrot, as if they were collecting books. Hey, I'm a parrot and I like parrots as much as the next guy but tell me, when was the last time a book left droppings on your shoulder? Does a book perch on your fork and hijack food on the way to your mouth?? Chew the furniture? We're like dogs with wings only our bite is worse than our bark (though my bark is poifect Pekingese). Then again, how many books can fly, psychotically chuckle, or demand Italian comfort food? Edward Lears's magnificent Illustrations of the Family Psittacidae, or Parrots (1832); Selby's Natural History of Parrots (1836); W.T. Greens's Parrots in Captivity (1884); the Duke of Bedford's Parrots and Parrot-Like Birds in Aviculture (1929); Joseph Forshaw and William T. Cooper's modern classic Parrots of the World (Melbourne, 1973); Rosemary Low's The Parrots of South America (1972), Parrots Their Care and Breeding (1980), Amazon Parrots (1983), and Lories and Lorikeets, the Brush-Tongued Parrots (1977); even Stroud's Digest on the Diseases of Birds (1939) by Robert Stroud, the Birdman of Alcatraz; and many more. Don't get me started on the great ornithology and natural history color-plate books featuring members of my fine feathered family, eg., William Jardine's Naturalist Library (1836). I've seen most all, antiquarian through modern. C'mon, parrot peeps, get crackin' and start collectin'! [Editor's note: translated into parrotese, this may be interpreted as a gentle nudge or emphatic nip to exposed flesh]. 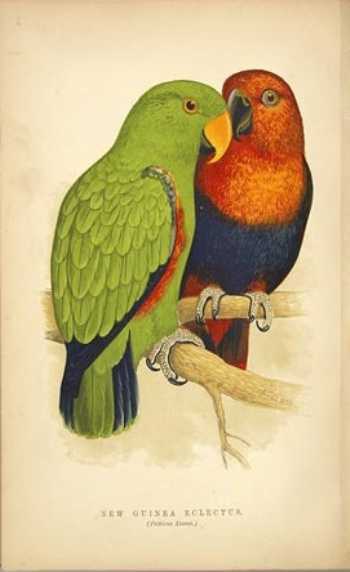 The other day Gertz shows me The Speaking Parrots (1884) by Dr. Karl Russ (1833-1899), the first translation into English of Die sprechenden papageien. Ein hand- und lehrbuch (Berlin: L. Gerschel, 1882), that book the first separate edition of volume three, Die Papageien, of Russ' Die fremdländischen Stubenvögel, his ten-volume series (1878-1881) originally published in Magdeburg. Never seen it. Never looked at the color plates, never read it. 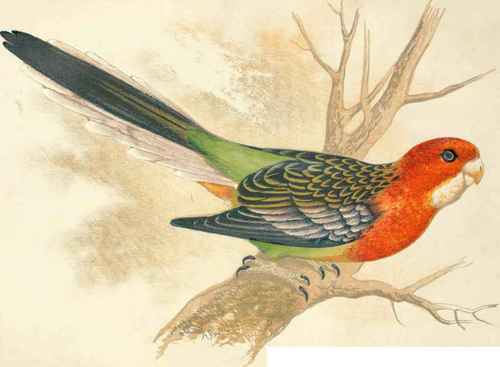 I like it, and give it 5-Seeds, my highest rating, despite the fact that the otherwise stunning chromolithographs are not completely faithful to the true colors of the birds. I'm pleased it was translated; I've got enough problems with English, fuggetabout sprechenden Deutsche. 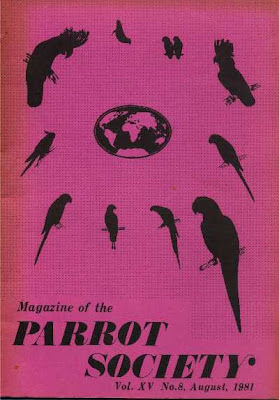 I want to bring to your attention one of the strangest works in the annals of parrot literature, found in the August, 1981 issue of The Magazine of the Parrot Society, a British journal for the parrot-obssessed. The Brits are even more loony about parrots than Americans so, naturally, it accepted the following article by a feather-brained Yank. I witnessed the incident at Casa Gertz leading to up to this therapy which, performed on a duck or not, screamed quack. While Ba-Ba, a Tres Marias Amazon and the bane of my existence, cockatiels Felix and Oscar, and The Canary With No Name watched, Gerald McBoing-Boing, a Yellow-Backed Lory, insanely attacked Pépe, a Scarlet Macaw, four times his size in another weight class entirely. Macaw bit toe of Lory. Lory didn't quit. Lory had to be separated from macaw before macaw ate lunch. Toe required amputation. 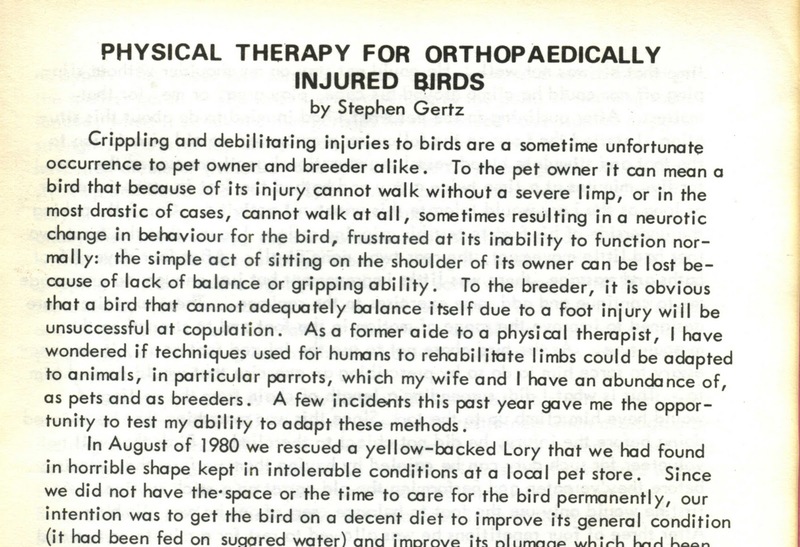 Gertz, who received his veterinary degree via mail order from a diploma-mill in Ulan Bator while working as a physical therapy aide for a coked-up PT at a health club in Los Angeles, performed the procedure and post-surgical rehab. 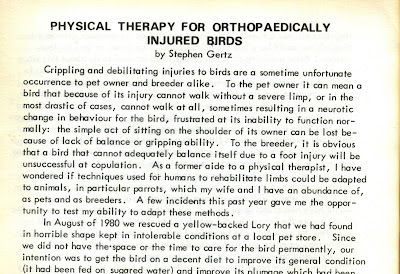 Gertz was a prodigy; damn if it didn't work! He showed me a copy of the article when it was published. After ripping it to shreds I was hungry. "I want a great big pizza." Four years after Gertz hopelessly began teaching it to me the phrase finally emerged from my keratin lips. But I haven't said it since and have no plans to do so; ha-ha! I've moved on. I'm an autodidact; who needs Gertz? My ace impression of John Moschitta's speed-speaking FedEx commercials and whistling of Flight of the Bumble Bee are the talk of the parrot world. My friends and colleagues can't stop squawking about it. RUSS, Dr. Karl. 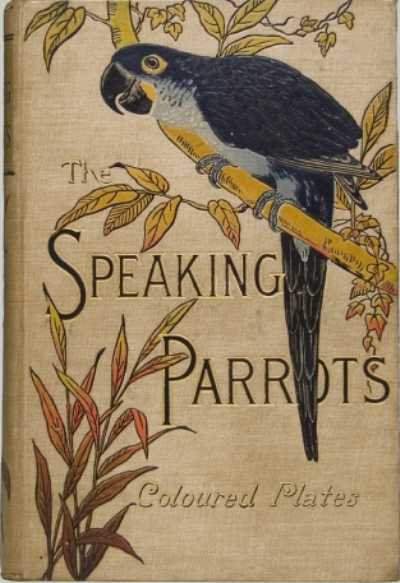 The Speaking Parrots: A Scientific Manual. 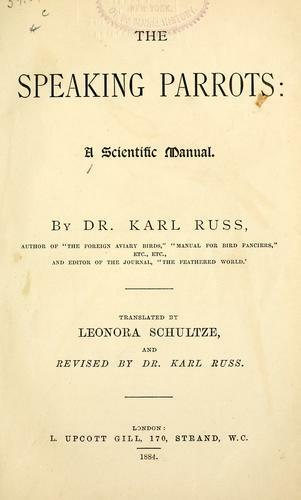 Translated by Leonora Schultze and Revised by Dr. Karl Russ. London: L. Upcott Gill, 1884. First edition in English. Octavo. viii, 296 pp. Half-title. Eight chromolithograph plates including frontispiece, nine b&w plates, misc.illustrations. Advertisements at front and end. Publisher's pictorial cloth. As a former parrot owner (Military Macaw, Blue fronted Amazon, and Loris) I sympathize with the Parrot- what they have to put up with! My adult daughter still has a malformed thumbnail after Zack the Macaw decided she was lunch; my middle son had his left index fingers almost severed at 3 months because the Blue fronted was jealous! is almost an impossible task for a human being. 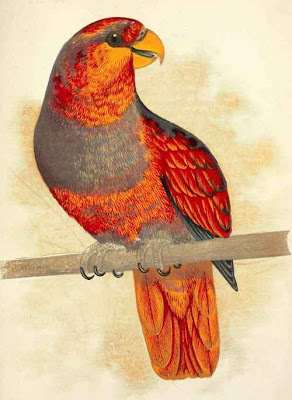 There are many special categorys in parrot art to be understood. And these are not definitive in nature.